Has financial stress become the new normal for most of us? A broken major appliance or leaky roof? A family member needing assistance? 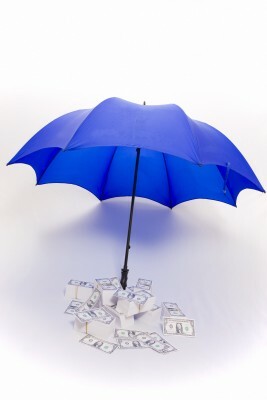 Without a sizeable liquid rainy day fund, you may be forced into selling or liquidating your nest egg assets prematurely—the investments you planned on keeping over the long haul. When this happens, the timing is often terrible. You’re at the mercy of current market conditions and forced to sell at the worst possible time. But what if your financial pyramid looked like this? Can you sense how much peace of mind that would give you? 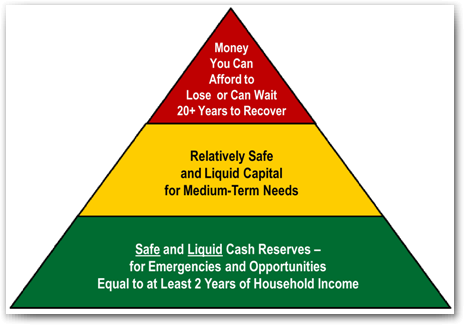 When safe and liquid cash reserves are the foundation of your pyramid, life is a lot less stressful. Rather than walking a tightrope in a strong wind with nothing to catch you, you’re working with a financial safety net. A core built on safe and liquid savings gives you stability, accessible resources, and restful nights. A core built on the inherent gamble of investments? Pull out the Dramamine and Ambien! How much cash should you stash? 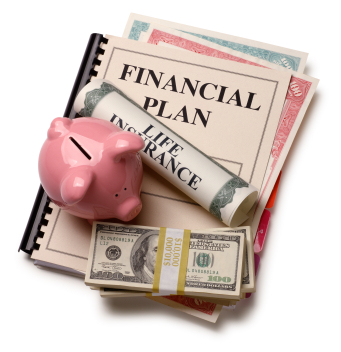 The conventional advice is to have a fund equal to three to six months of your household income. But during the recession that started in 2008, many people discovered too late that three to six months’ income wasn’t even close to being enough. Millions of people who lost their jobs remained unemployed for well over a year, or even two. At the same time, we lost the ability to use our homes like ATM cash dispensers as real estate took a hit, and lenders clammed up. To have the security of a real safety net, why not build a fund equal to at least two years of your income? Put that money in a place that is safe and liquid, so you can easily get your hands on it when the proverbial you-know-what hits the fan. Does it seem impossible? You probably won’t build this fund overnight. But if you increase your savings by even just 1 or 2% each year, you won’t feel the pinch, and you’ll be surprised by how quickly your rainy day fund will grow. I know, I know! Who wants to put that much money in a savings, money market account, or CD, where it earns so little interest these days that you need a magnifying glass to see it? That’s why so many people use the Bank On Yourself method – it keeps your savings safe and liquid and gives you healthier growth. Just as emergency expenses come up when we least expect them, so do opportunities! Imagine the opportunities you might be able to take advantage of if you had safe and liquid cash reserves equal to one or even two years of your household income? Having money safe and liquid only gives you more options, rather than limiting your options. 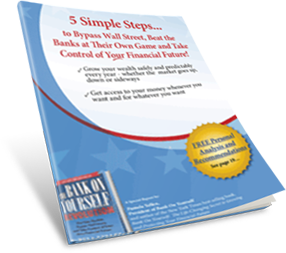 Are you ready to have the peace of mind of knowing at least a chunk of your nest-egg is in a plan that goes in only one direction – UP! – and has never had a losing year in over 160 years? To find out what your numbers would be – and how you could have the peace of mind of a sizeable rainy-day fund – request your FREE Analysis today. Can we agree that families in past generations had a little more time around the family dinner table to discuss what was going on in their individual and collective lives? No television blaring, fingers texting or iPods jammed in children’s ears. Mom and Dad weren’t usually racing in from ten to twelve hours on the job, and life wasn’t rushing by so quickly that you hardly had time to think. But that was then, and this is now. In order to have good discussions with one another, we have to schedule them. 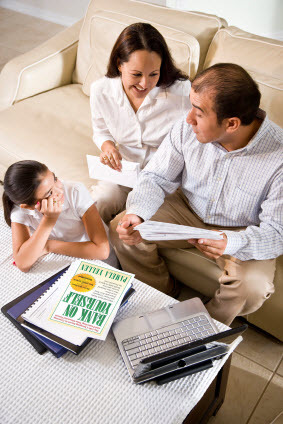 One thing I recommend is to hold a monthly Family Financial Discussion Night during which you focus together on the things like a family budget. Much like diets, budgets are no fun. But a strategic spending plan can be, and even children as young as four or five can get involved. Create your family’s “Personal Spending Rules” together to work toward family goals and help you make spending decisions today that build happiness for you now and in the future. Your children will not only learn good financial skills through this process but they’ll take pride in being part of it. Step 3: Do You Need It or Just Want It? Grandma, especially if she grew up during the Depression, was a lot clearer about the difference between want and need. But then, Grandma only had to deal with the occasional salesman at the door. Today Madison Avenue has got us surrounded! And Madison Avenue is fully aware that spending is triggered by emotion. They’ve hypnotized many of us to react to our emotions and go on automatic pilot when it comes to spending. But we’re smart. We know that keeping up with the Joneses is not the road to happiness those Mad Men try to tell us it is. And when we take a moment to stop and reflect, we do really know what we need versus what is just a momentary flash-in-the-pan, won’t-outlast-a-bowl-of-popcorn kind of desire. Before each purchase, get yourself off emotional auto pilot. Take a deep breath (and a couple of days) to consider whether you really need whatever it is. An odd trick to shift your mindset – that really works! – is to clench your fist or bicep when you’re considering making a purchase. And teach your children about the difference between need and want – not by your lectures, but by your good example. What Steps Should You Take Today? The key, of course, is to start building your emergency fund right now—TODAY! Remember, it was not raining when Noah built the Ark. He got the message then got to work. He didn’t say, “Yeah, that makes sense. But the sky looks pretty clear for now. I’ll start on it later. Maybe tomorrow.” Tomorrow never comes, does it? The cash you save in your Bank On Yourself plan can be that ark, ready to set sail at the least sign of trouble. But it doesn’t work as well if you start building it in the middle of a financial storm! The unexpected doesn’t wait around for us to get our act together. The unexpected just shows up when it does. Please note that I said when it does, not if it does. As smart as we are, we can’t anticipate everything that will happen in our lives. We can only be like Noah: Get the message then get to work. The bottom line is that the more cash you have in a Bank On Yourself plan that’s safe and liquid, the more options you’ll have, the more peace of mind you’ll have, and the less financial stress you’ll have. The first step in building your ark is to request your free Analysis, if you haven’t already. But please do it now while it’s fresh on your mind.